Joyce Tang’s (滕麗名) name is synonymous with “pitiful” in the minds of many fans. 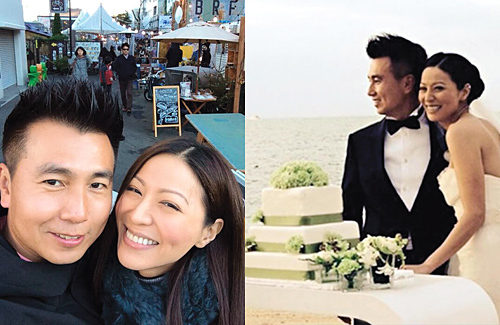 After dating Marco Ngai (魏駿傑) for nine years, the couple’s relationship ended on bad terms. Marco went on to marry Zhang Lihua (張利華) merely months after their breakup. Joyce’s love life continued to be tarnished by seedy men, including Derek Kwok (郭政鴻), who was revealed to have been married while pursuing Joyce. When she finally seemed to have found light at the end of the tunnel with Matthew Chu (朱建崑), it was revealed that Matthew was two-timing Joyce and actually had a long-term girlfriend. Despite so, Joyce successfully won over Matthew. The couple wed in 2013. Sounds like she’s getting the end of the stick but it’s whatever floats her boat. She sounds like a kind, caring and selfless wife unlike most women these days. Her husband is lucky to have her so hope he cherishes her. Yes, lets hope her husband treats her well. Her personal life has been rocky to say the least, she deserves to find a good man who will love and cherish her. I’m confused with the title on the top so did her husband travel somewhere and wasn’t home that’s why it said she wants him want to come home? If a couple doesn’t want to have a children after married I think it’s normal as long both of them are happy that’s all matter. @cutie777 her husband has not travelled, he can be a selfish and self centred person (her words not mine), who does not like to return home. So she will do things to lure him home or to keep him home. That’s my understanding of this article. @dramafan okay got it thanks for your reply and I’m sure he’s a great husband otherwise she wouldn’t have married him at first.